My teaser doesn’t tease very much, since it’s from a book that most people have read by now. Yep, I am currently re-reading the Harry Potter books! 🙂 The podcast is doing a big Harry Potter party in July. Expect several “teasers” from them over the next few weeks. 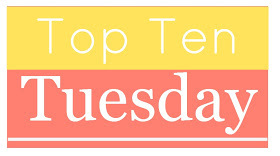 Next up is Top Ten Tuesday, hosted by “The Broke and the Bookish.” This week’s topic is so easy. You only want ten? I can give you a lot more than that! But I won’t. These are all the new books that I haven’t gotten around to reading yet, but will be read this summer, by hook or by crook! I’m not going to count the Harry Potter books, although they’re definitely on there. You really do need to read the books. They are so much better than the movies, although I love the movies too. I liked the Harry Potter series! One of my favorite series of all time, and I read a lot! Thanks for stopping by my blog! Nice to be reminded about Harry Potter. Come see my teasers for Heart of Obsidian by Nalini Singh and Ink by Amanda Sun. Happy reading! Loved your teasers as well! If I Stay is a heartbreakingly beautiful book. Great selection of books on your TBR list. It came recommended very highly. I’ve heard lots of good things about it. I can’t wait to read them. Welcome to TTT, by the way! I enjoyed your teaser from an “oldie” but “goodie”! Loved the series, good teaser. One of my favorites! I’m really enjoying re-reading it again. I’ve got all the Potter books. Maybe it’s time for me to reread them too! You can re-read them with our podcast, if you like (shameless plug). 😉 We’re going to have a good time, I think. I re-listen to the audio books on a regular basis. I can even “hear” Uncle Vernon’s voice right now. 😉 Great teaser! Here’s our Teaser this week. I haven’t listened to the audio books. I’m not really an audio book person. But I’ve heard that the Harry Potter ones are excellent. Divergent! 🙂 I loved it, and Insurgent, and am anxiously awaiting Allegiant! 🙂 I also really loved Anna Dressed in Blood… wonderfully told and creeptastic. I’ve heard nothing but good things about this whole series. I can’t wait to read it, but there are other books ahead of it in line. I’ll get to it soon, I promise!